Patio Roof Designs allows us to make use of our patios in all kinds of weather instead of only during our beautiful summer months. Enjoying our patios with friends and family is a South African way of life. Almost every home in South Africa has some type of patio or deck - whether it is a beautiful seaside home high against the slopes of Table Mountain (which is in fact one of the New 7 Wonders of Nature), an apartment in Johannesburg or a perfect home in one of our golf estates - we all love to entertain outdoors. No matter whether you are designing a new patio from scratch or wish to enclose your existing patio, these patio roof designs will give you some options to consider. How much visibility do you want. 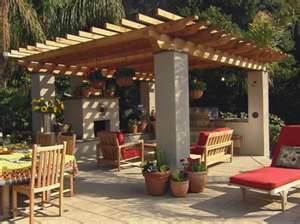 So on this page we will only explore loose standing patio roof designs, i.e. patios where the walls are not enclosed. While most people view a patio as a summer commodity, enclosed patios actually allows us to embrace the indoor/outdoor living we all crave for during all seasons. This allows us to furnish these areas and use them for all-year-round entertainment. The patio roof on the right here may not be what you would think of as an "all-year-round" entertainment area, but you can see that it gives protection from the sun and in the way it is situated in this setting, it also gives protection from the wind. 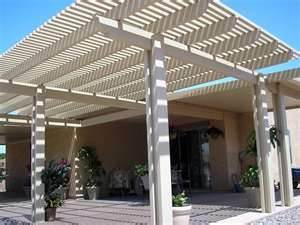 Once you have decided on how to enclose your patio, you need to choose your materials. Choose materials that will withstand the weather and is hardy outdoors. Especially in South Africa the weather conditions can be harsh.....we have a relentless sun shining down and at the coastal areas, the salt and wind can be an additional devil on any outdoor equipment. As you can see on the left, this beautiful wooden structure adds another dimension to the modern home. If you don't mind to hide this beautiful wooden structure, this can be used as a support structure for a vine, which will then provide shade in summer and allow sun through in winter. Even if you don't want to do that, with proper design and layout, it will still protect the living area from too much sun in summer while allowing the warm sunshine to enter the room during winter. This patio covering is completely different from the previous two again. Modern, with lovely height to add to the beauty of the home. 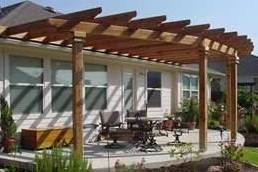 You can see that there are many benefits that come with enclosing your patio. Apart from adding value to your home, you can now enjoy that much-loved patio as a living area that can be used all-year-round.